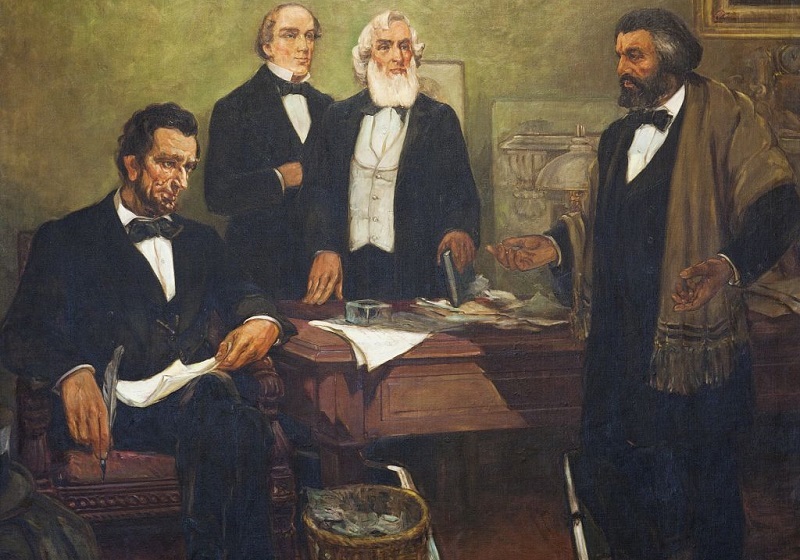 Frederick Douglass appealing to President Lincoln and his cabinet to enlist Negroes (1943), mural at the Recorder of Deeds Building, Washington, D.C., by American artist William Edouard Scott. Image courtesy of The George F. Landegger Collection of District of Columbia Photographs in Carol M. Highsmith’s America, Library of Congress, Prints and Photographs Division. For fifty years the country has taken the law from the lips of an exacting, haughty and imperious slave oligarchy. The masters of slaves have been masters of the Republic. Their authority was almost undisputed, and their power irresistible. They were the President makers of the Republic, and no aspirant dared to hope for success against their frown. Lincoln's election has vitiated their authority, and broken their power. It has taught the North its strength, and shown the South its weakness. More important still, it has demonstrated the possibility of electing, if not an Abolitionist, at least an anti-slavery reputation to the Presidency of the United States. Yet, because Abraham Lincoln was “not an Abolitionist,” Douglass was frequently one of the administration’s harshest critics, frustrated with the lack of movement toward the goal of emancipation. He criticized Lincoln’s first inaugural address (“the Republican President bends the knee to slavery as readily as any of his famous predecessors”); he was shocked by Lincoln’s order countermanding General John C. Frémont in Missouri that freed the slaves of anyone fighting against the Union (“this policy is plainly one which can only dishearten the friends of the government and strengthen its enemies”); he despaired when he learned that Lincoln had been entertaining proposals to colonize “the colored race” in Central America (“the nation was never more completely in the hands of the slave power”); and as late as 1864 he was disappointed in the President’s inability to fill his promise to compensate black soldiers equally (“The treatment of our poor black solders [has] worn my patience threadbare”). Newspaper editor Horace Greeley had a testy relationship with Lincoln, most famously during a public exchange after Greeley criticized the progress of the war and the lack of progress on emancipation—a mere month before Lincoln first made public his intention to issue the Emancipation Proclamation. William Buckingham was governor of Connecticut. Orpheus C. Kerr (a name chosen to sound like “Office Seeker”) was the pseudonym of humorist Robert Henry Newell, whose series of satires during the Civil War were widely read. I do not know more about Mr. Lincoln than is known by countless thousands of Americans who have met the man. . . . If you don't see the full selection below, click here (PDF) or click here (Google Docs) to read it—free!